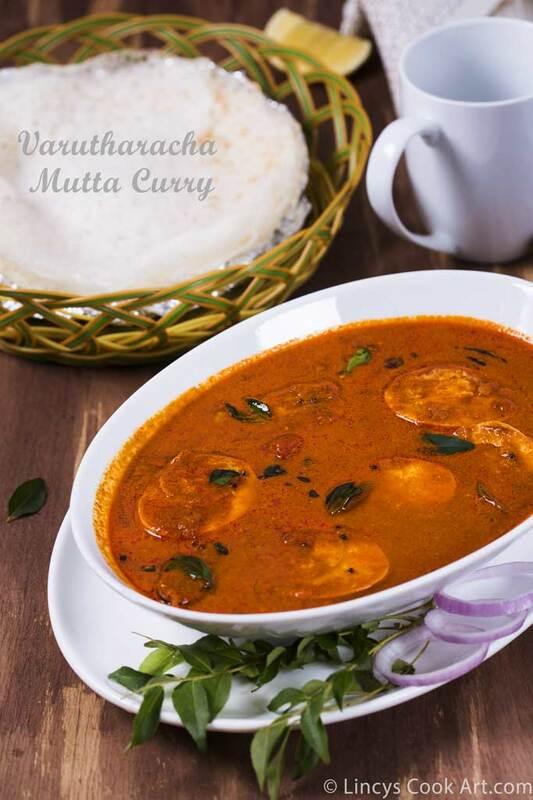 Varutharacha mutta curry| Eggs in roasted coconut gravy is a very famous dish in Kerala. It is prepared basically eggs cooked in roasted coconut based sauce in nadan style using coconut oil. It is quite easy to prepare and it is full of flavours as the spices are freshly roasted and ground for the gravy. You get more gravy in this curry as the ground paste adds volume to the gravy. Perfect for breakfast and also dinner. Suits with palappam, idiyappm, puttu, chapatis and also with rice. Versatile curry which goes almost with almost all Indian dishes. Hard boil the eggs and peel the eggs; set aside. For the masala dry roast together the red chillies, coriander seeds, peppercorns, cut pearl onions, coconut, fennel seeds, cinnamon, clove and cardamom. Roast on medium flame till you get the coconut golden colour and get the nice roasted aroma of the other spices. Allow to cool and everything on a blender jar and powder well. Now add some water and grind to make a fine paste; set aside. Heat oil in a deep pan and splutter the mustard seeds now add the curry leaves. Add the chopped onion with some salt and cook till it becomes translucent. Add ginger and garlic paste/crushed in pestle and mortar and cook for few minutes till the raw flavour leaves. Add the tomato and cook till mushy. Now add the ground masala with enough water to dilute the gravy and some salt; bring it to boil. Once the gravy boils for about a minute or two add the egg cut in to two or the whole egg with slits on the surface. Do not cook more than 2 minute after adding the eggs over cooking makes the eggs hard and rubbery. Allow the gravy to boil once sprinkle some curry leaves more and switch off the gas. Note: You could add more pepper and reduce the red chillies if you like to get brown colour. You could replace red chillies and coriander seeds with chilli powder and coriander powder.